Rounds and rounds of oysters please. Let me start off by saying that the happy hour at Mermaid Inn does not take away from the fantasticness that is The Mermaid Inn. A bustling seafood restaurant with 3 locations The Mermaid Inn has easily become one of my absolute favorite restaurants. I dined at the Upper West Side location last year during Memorial Day weekend and totally enjoyed every single moment of it. This is also the first time I've really sat down and took an interest in oysters, because The Mermaid Inn does oysters so so right. The Mermaid Inn also does happy hour right. From 5p-7p, happy hour consist of $1 oysters and clams, half price beverages an and assortment of delicious small dishes that restaurant regulars line up for. If you are lucky enough to grab a 5pm reservation over on OpenTable, get there at 4:45p and stand on line. I was blown away at the line that formed to get into this restaurant for dinner but once inside, I knew I would stand on line any day. The restaurant opens at 5pm for dinner and by 5:15p the bar was completely full and by 5:30p the dining room was almost half full. Its really not a game at Mermaid Inn. You can order as many oysters as you like, but 6 just isn't enough. Garnished with classic cocktail sauce, mignonette, and fresh lemon, you will be ordering another round of oysters in no time. The shrimp and avocado sliders are another happy hour favorite as plump grilled shrimp and avocado are sandwiched between toasted and buttery potato buns. 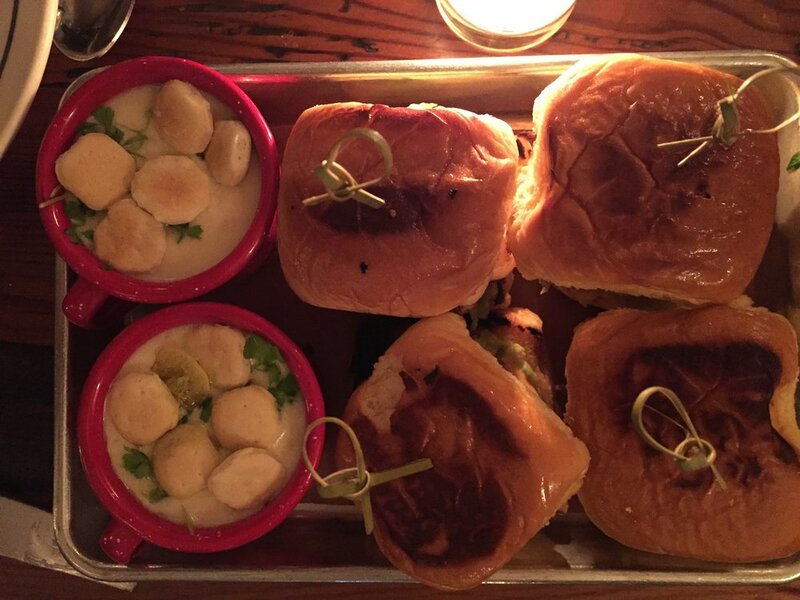 I recommend you get 2 of these sliders per person because you wont want to share. The New England clam chowder is borderline decadent its so rich and comforting as its laced with bacon and fresh clams. This is another win. If your in the mood, get a BOWL. I will admit that all of these amazingly delicious items will add up to a hefty happy hour tab, so I do suggest that you order other things on the menu as well. With the warm weather pretty much knocking at our door The Mermaid Inn is PERFECT for an after work happy hour dinner with friends. You will not be a bit disappointed, as The Mermaid Inn begins to consume your life as it has mine.